At West Mill Smiles we feel that educating our patients is extremely important so you are able to make informed decisions about your dental care and treatments. Our staff take the time to listen to you in order to find out what your dental concerns and needs are. We offer treatment plans based on your needs, our recommendations based on your examination, and your wants. We make the decisions as a team as to what treatment plan is best for you. We participate in advanced dental courses so they are able to bring you the latest in dental techniques to make your visit more comfortable and give you high quality results. 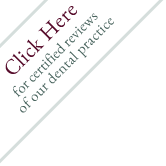 Click on the links below to read more about the dental services we offer.